← Going to the extreme: Are GOP governors too radical? Six years ago when I served on the Board of Finance and Taxation of the City of New Britain (population 70,000) in Connecticut, our municipal budget was $190 million. Of that total amount, as much as $130 million went to the Board of Education. The Superintendent of Schools was paid an annual salary of $155,000; her several Assistant Superintendents, $130,000; a bunch of Principals, $120,000; their Assistant Principals, $100,000. The median salary of teachers was $80,000 for a 183-day work year. Moreover, municipal employees received family health insurance benefits costing nearly $20,000 per year. Similarly, a number of firemen and police officers earned $80,000 per year, since their union agreement required the funding for unfilled positions, resulting in considerable overtime pay. After twenty or twenty-five years of service, they were entitled to retire at 70% of their last three years’ average salary, conveniently padded with unnecessary overtime. When collective bargaining in Wisconsin prevented the governmental employees of Wisconsin from agreeing to contribute 12% to their healthcare and retirement benefits, I did not feel particularly sympathetic toward the disgruntled governmental employees. Most of us who are fortunate enough to be employed in the private sector have been contributing 20% to 50% to our healthcare insurance, while picking up the entire cost of insurance on our family members. Many of us do not even have health insurance or retirement benefits offered by our employers. Furthermore, our pension plans are not defined benefit plans but paltry contribution plans, often a 3% simple IRA. Without the willingness of governmental employees to refrain from salary increases and to contribute more to their benefit plans, we, the taxpayers, will be burdened with more property and income taxes. Consequently, the battle may not just be a battle between governmental employees of Wisconsin and Governor Walker, but that between all governmental employees and taxpayers. All Government employees should realize that the process of collective bargaining, as usually understood, cannot be transplanted into the public service…Particularly, I want to emphasize my conviction that militant tactics have no place in the functions of any organization of Government employees. Upon employees in the Federal service rests the obligation to serve the whole people, whose interests and welfare require orderliness and continuity in the conduct of Government activities. This obligation is paramount. Since their own services have to do with the functioning of the Government, a strike of public employees manifests nothing less than an intent on their part to prevent or obstruct the operations of Government until their demands are satisfied. Such action, looking toward the paralysis of Government by those who have sworn to support it, is unthinkable and intolerable. Governor Walker has to resolve a budget deficit of $3.6 billion. His choice is simple: pass it all onto the private citizens in the form of taxes; or ask governmental employees to contribute 12% to their benefit plans and share the pain. The unions initially refused to contribute 12%, saying it violated their collective bargaining agreement. In recent days little has changed since then. In Madison, while government union bosses have said that government workers would be willing to contribute to their pensions and pay a slightly larger portion of their healthcare premiums, local bargaining units are unwilling to accept those contributions. In Janesville, government workers are proposing a contract that includes 2% pay increases for the next three years, with the government paying all of the workers’ pension contributions and 92% of their health insurance premiums. In La Crosse County, government workers have agreed to a one-year contract with health and dental premiums at the same level as 2010, with the county covering the full pension payment of most government workers. Government workers with the Milwaukee Area Technical College agreed to a new contract where the workers contribute nothing toward their pension. In Madison, government workers have proposed a contract for a 3% pay raise with their current pension and health benefits for the next two years. In Racine, government workers have agreed to a contract that includes pay raises. In Sheboygan, government workers agreed to a contract where nurses pay nothing toward their pensions. During these dire economic times do we need to curtail collective bargaining of governmental workers? Or should our armed forces, also governmental workers, have collective bargaining rights, too, allowing them to go on strike for increased wages or benefits? Is the argument in Wisconsin really over the rights of governmental workers or is it about their raises and benefits? Did you hear any governmental worker cry out for employees’ rights when millions of private citizens lost their jobs and benefits? In the coming months and years, with all of the municipalities and states suffering severe deficits, you, too, may see a similar battle occurring in your state. Will you join with the ranks of governmental employees, supporting their annual salary increments and their reluctance to share in the costs of healthcare and retirement benefits? Or will you be looking at the increase in your tax bills and complaining about their annual increments? This entry was posted in Accountants CPA Hartford, Articles and tagged Barefoot Accountant on the budget battle in Wisconsin, collective bargaining of governmental employees, demonizing Governor Scott Walker, is Governor Scott Walker really the devil?, is Governor Scott Walker the Devil, Wisconsin budget battle. Bookmark the permalink. 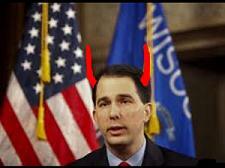 One Response to Is Governor Scott Walker the Devil? The article is a bit misleading. In the teachers’ union bargaining agreement, wage concessions were made to pay for the benefit contributions which Walker claimed the teachers were not ‘paying.’ As accountants, we can see the spin involved there. In addition, a false choice was presented. Walker was not forced to give the tax break to the states wealthiest citizens, but he chose that option which would imply that closing that deficit gap was not his highest priority. Finally, it became clear that the ultimate breaking point was not financial in nature, but the attempt to strip the bargaining rights and structure of negotiations. Yes, the move backfired and we can see from all the actions taken in Madison since the date of this post that Walker is far more the demon than the victim here.